Soft-serve machines are used to freeze, add air and to dispense soft-serve ice cream mixtures and frozen yogurts. New advanced soft-serve machines are introduced which are much energy efficient than the earlier ones. Machines are required to work both day and night to maintain the consistency of products and to store them at proper temperatures. Soft-serve equipment is on rise owing to rising popularity of frozen yogurt backed up by the growing interest of consumers towards healthier dessert options and quality experience. Demand for soft-serve machines is growing as half of the global population consume ice cream and frozen yogurts regularly. Children age between 6-12 years has the highest uptake (62%) and adults (58%) of ice-cream globally. China has become the largest consumer of ice-cream in 2014, closely followed by United States. The average consumption of ice cream is 1.8 times/week by ice cream consumers. Advancement in soft-serve machine allows the operator to work efficiently at much larger profit margins as compared to previous machines which consumes large amount of energy. The key market players and prominent vendors are providing high quality products and holds strong presence in major countries. For instance Argosay Group International, U.S. based soft-serve machines manufacturer acquired Donper America in 2014, and marked its strong presence in North America. Growing interest towards frozen yogurt and other healthier substitutes are driving the growth of global commercial soft-serve machines market. Commercial soft-serve machines are widely used in quick service restaurants (QSRs) and full service restaurants. Wide-range of soft-serve flavors offered are also driving the commercial soft-serve machines market. Energy efficient machines and low service maintenance products in food service industry are in great demand and likely to boost the sales of new energy-efficient soft-serve machines. 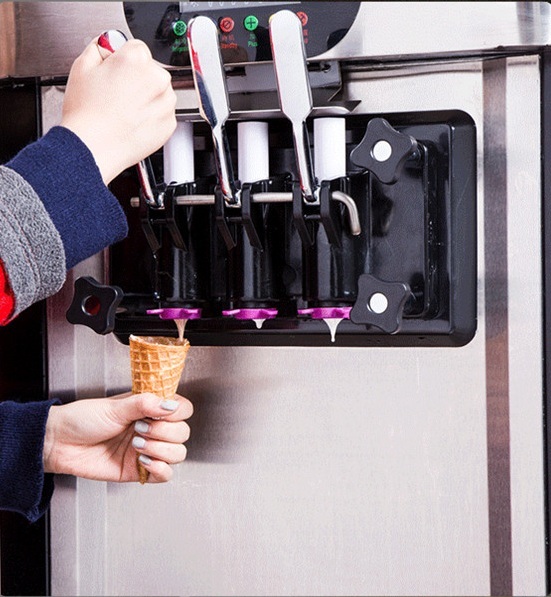 Energy efficient soft serve machines reduces both labor and electricity cost. New user friendly machines can be operated by single person or directly by the consumers. Advanced and improved features in commercial soft-serve machines help in attracting new customers. Market players always try to introduce new healthier options such as lower level of calories and fat, to attract health conscious consumer base like parents and old age consumers. However, need for regular maintenance and replacement of parts to ensure quality and consistency of product is required, which results in extra expenditure on machines. Maintenance cost and risk of contamination of product, expected to hamper the growth of commercial soft-serve machines market. Global commercial soft-serve machines market valued more than USD 621.2 Million in 2016 owing to growing interest towards frozen yogurts and ice-creams. Further, the market is expected to expand at a CAGR of 5.1% over the forecast period i.e. 2016-2024. Global commercial soft-serve machines market is projected to reach USD 954.5 Million by the end of 2024. Geographically, Asia-Pacific region dominated the global commercial soft-serve machines market with more than 29.0% of revenue share in 2016. Asia-Pacific is closely followed by North America with more than 22.0% revenue share in global commercial soft-serve machines market in 2016. North America lost its dominance over ice-cream market after ice-cream consumption in China grew by 8.0% in 2014. Europe commercial soft-serve machines market generated a revenue share of 19.2% in 2016 on the back of large ice cream consumer base in the region.